Hot lunches are available each day and are ordered in advance by parents using an online ordering system. Our lunch provider cooks the meals at a nearby secondary school and provides a daily choice of hot meals plus a packaged lunch option on a 4 week rotating menu. Alternatively, the children may bring a packed lunch. 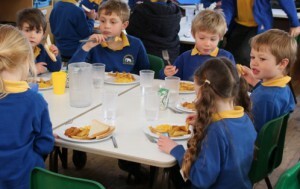 The children are supervised during the lunch break and we encourage school years to mix to make eating a social time. School meals are supplied by Aspens Services Ltd from the Langtree kitchens. Meals must be ordered in advance. Aspens Servicesâ on line meal ordering system is now fully operational for pre booking and payments via Pay Pal (using a Pay Pal account or debit/credit cards). There are full instructions on the Aspens web site with each week’s menu available for downloading. The school is part of the Governmentâs School Fruit and Vegetable Scheme. Under the scheme, each child aged four to six is entitled to receive a free piece of fruit or vegetable each school day. This scheme, which is voluntary, reinforces our commitment to healthy eating. Children are allowed to bring in healthy snacks for break times.